The morning after large numbers of Bulgarian police mounted wildcat protests in Sofia and other cities over proposed cuts to their severance pay and bonuses, the government backed down, saying that the cutbacks would apply only to new and not existing employees. Prime Minister Boiko Borissov slammed the police protests, which took place “spontaneously” on the night of November 3, blockading city roads and some motorways, as unacceptable, with police showing society how to break the law. But, after Borissov met Finance Minister Vladislav Goranov and Interior Minister Roumyana Buchvarova on the morning of November 4, it emerged that the plan to cut 20-salary payments on severance to 10 would apply only to those who joined the Interior Ministry from now on. These privileges would remain in place for the many tens of thousands currently on the payroll of the Interior Ministry – some of whom had submitted their resignations after plans to change pay provisions for ministry employees in the draft Budget 2016 had emergd in recent days. Borissov, speaking after the November 4 meeting with his finance and interior ministers, said that the proposal to reduce severance pay to 10 salaries would enter into force from the day it was adopted, and this would apply in the Interior and Defence ministries – the latter also having been subject to Goranov’s cutback proposal. “By the way, I really hope that the judiciary will determine whether judges, prosecutors and investigators should receive 20 salaries, because it’s not only the Interior Ministry and Defence Ministry,” he said. Interior Ministry chief secretary Georgi Kostov, who also attended the meeting, told reporters afterwards that the seniority basis, a two per cent supplement for each year on a monthly salary but not more than 40 per cent, would be incorporated into salaries. Food allowances for police now will not be cut. 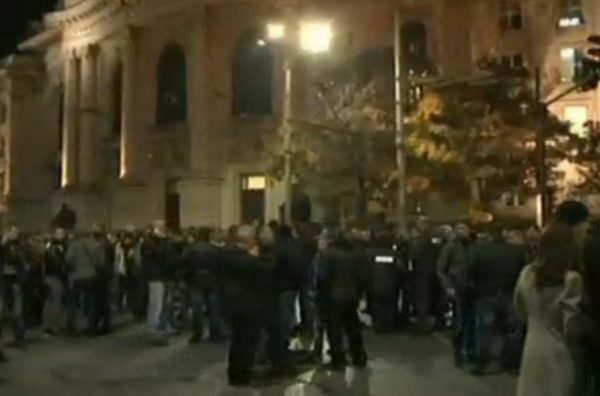 Interior Ministry employees blocked roads outside Sofia University for several hours on the night of November 3. At various points in the capital and in other cities, gatherings of police disrupted traffic and angered commuters. Hints before the meeting that there would be a backdown brought criticism from the Reformist Bloc, the minority partner in the coalition government. The bloc’s Radan Kanev said that it would be a very bad signal if an illegal protest overturned a political decision. On November 4, police protests called by trade unions at the Interior Ministry were scheduled to start in the evening, an arrangement made before the Borissov-Goranov-Buchvarova talks, but the morning already saw protests in various places. Police in Madan and Rudozem blocked the main road leading through the two towns towards the Greek border. In Bourgas, police and prison officers blocked streets in parts of the city for 10 minutes. Plans were to block access to the Makaza border checkpoint at noon. Protests also were planned for noon in Plovdiv and Blagoevgrad.